Clearly, I have too many cookie jars. I love cooking, and I love collecting recipes. 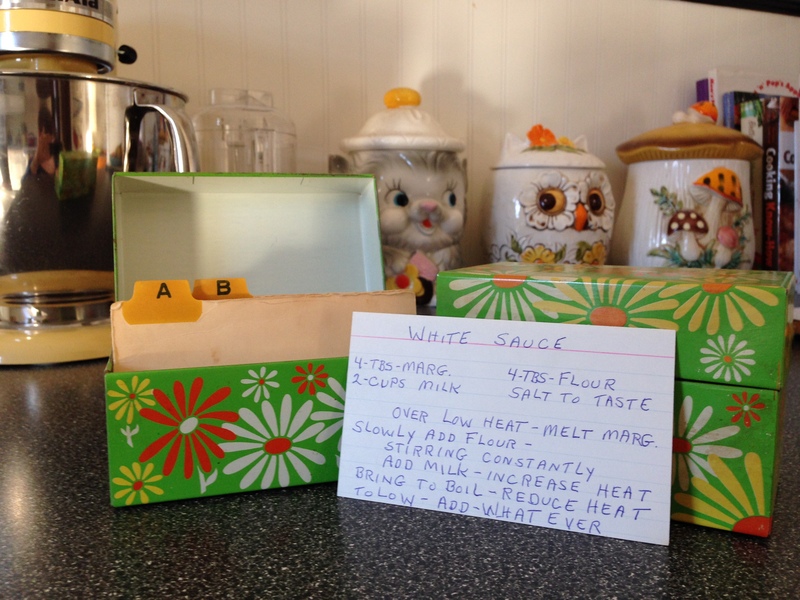 Lots of us have recipe boxes that we’ve inherited – I have my grandmother’s, and my husband’s grandmother’s. I also have a few of these little recipe boxes that I use for storing things like post cards or note cards. They’re really sturdy since they’re metal, and they come in all sorts of fun patterns like this green daisy print. I picked these two boxes up at a home in the Pittsburgh suburbs, and when I looked at them more closely I saw one still had a few recipes inside. I thought it would be fun to feature some classic recipes on this blog, and this seems like a great place to start. 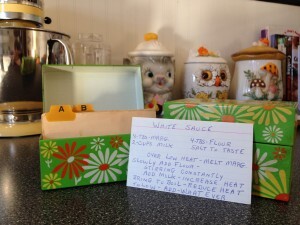 This box only has a handful of recipes in it – but a few of them have one thing in common: white sauce. There’s a recipe for eggs and peas on toast – covered in white sauce. There’s a recipe for ham and cheese – covered with white sauce or cheese sauce. What’s in the cheese sauce? White sauce and cheese. 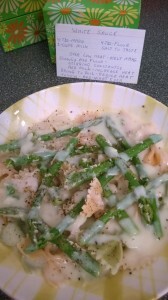 Clearly, this recipe was this homemaker’s staple dish! Anything involving bow ties is delicious. I appreciated the final instruction on the card – “Add Whatever”. 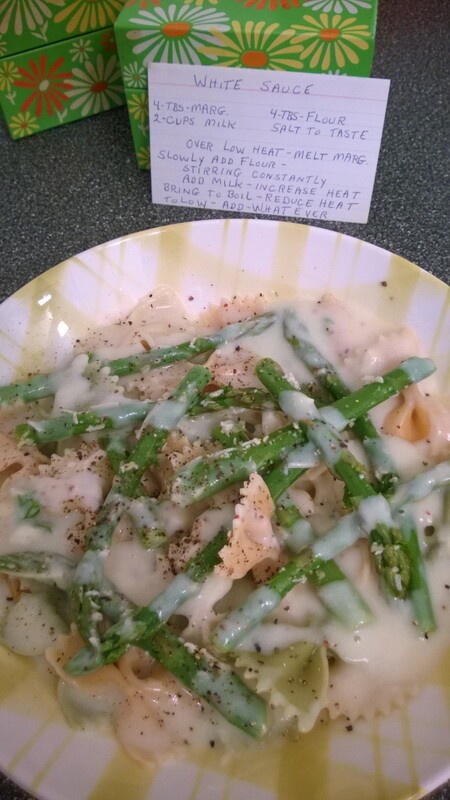 My whatever turned out to be asparagus tossed with parsley, Parmesan, garlic, and lemon, served over pasta with lots of pepper. 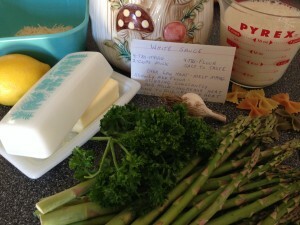 Asparagus tastes like spring, doesn’t it? Following the instructions was easy, because yes, this is a basic glossy white sauce! I made a roux from butter and flour, added milk (I used soy milk) – and yep. White sauce. I blanched the asparagus in boiling water for a few minutes, and then tossed it with herbs, cheese, lemon zest and juice. The whole thing turned out pretty good! Probably better than eggs and peas on toast, at least. If you’re interested in recreating more of this lady’s inspired cuisine, you can purchase these recipe boxes here in our Etsy shop. We also took home a great boomerang pattern Formica table – black and gray with hairpin legs – and another large piece of boomerang counter top in pink and white! When we picked up the pink piece, the fellow running the sale remarked that his mother had rolled out cookies on it every Christmas until she passed away. I’m glad to report that the counter will find a home in my kitchen – I hardly ever make cookies, but my husband makes a great pizza dough. Stories like this are what makes this job extra special. We also picked up a sign that reads “This Ain’t No Museum – This Junk is For Sale” – that’s a pretty accurate description of the situation! Keep an eye out for items appearing in our shop. This winter has been long and brutal for lots of folks in the States, including here in Pittsburgh. It’s finally spring, and I’ve already bought new sandals and started daydreaming about warmer weather! And what goes with warmer weather? A chance to wear all those pretty dresses that have been languishing in your closet these long winter months! I am a public librarian and, to a certain extent, adhere to the cardigan-loving stereotype – but this is one year that I will be happy to put my sweaters away. 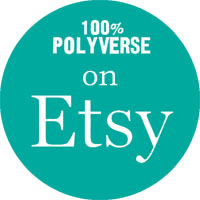 We’ve got lots of lovelies over in our Etsy shop, in case you feel like adding a new dress to your springtime wardrobe! Here are some of my favorites. Click on the photos to see the individual listings in our shop. This dress is simply adorable. This is a pale mint green polyester maxi dress with a collar featuring lace and embroidered strawberries! I have a soft spot for novelty patterns, and anything made for adults that is slightly childlike – or at least has the sort of whimsical touches that are usually associated with items made for children. This is a perfect example. 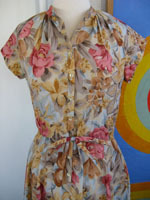 This dress is really too cute – a lighthearted fresh fashion statement from the 1970s. I can’t wait for strawberry season! Here’s another dress from the 1970s. 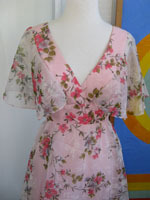 This is a darling maxi dress – very feminine, with a sheer pink floral overlay. I love these flowing graceful layers! The under layer on this dress is very crisp, and the whole thing is in wonderful condition. This dress would be right at home at a garden party, a wedding, or a formal dance. This one is another example of a formal dress from the 70s with a sheer overlay. Exquisite! This dress is NOS (New Old Stock) with the tags still on, and is just waiting to become a part of someone’s special day. I can see this dress being worn in a field of flowers by a hippie bride, can’t you? I’m not a very femme girl, but this dress makes me wish I had long hair, parted in the middle, and was standing in a field holding a bouquet of daisies. So romantic! I picked one more dress to showcase – let’s come back to reality with this one, shall we? This pretty 1960s shirtwaist dress doesn’t need a special occasion to shine. You could wear this dress to work or play, any day of the week. The soft cotton poly blend is really perfect for this season. This dress is by Anjac, a company founded in the 1940s by Jack Needleman in Los Angeles. Anjac is a combination of his and his wife Annette’s first names. Marc Needleman, the designer of this particular dress, was one of their three sons. The Needlemans became one of the most successful families in the L.A garment district, and moved from clothes on to real estate – Anjac Fashion Buildings still exists as a real estate company. When Jack passed away in 1999, he was a major philanthropist who had donated millions of dollars to charities and to organizations like the Los Angeles Conservancy. Isn’t that a fantastic history for such an unassuming garment? Now that I’ve spent some time talking about these lovely dresses, I’m even more ready for sunshine and warmer weather. I hope all of you are enjoying your spring season! A selection of our recent finds. We often get asked what we like so much about vintage living. There are several answers to this question, but I am going to start with one of the most important. Vintage living is all about sustainability! 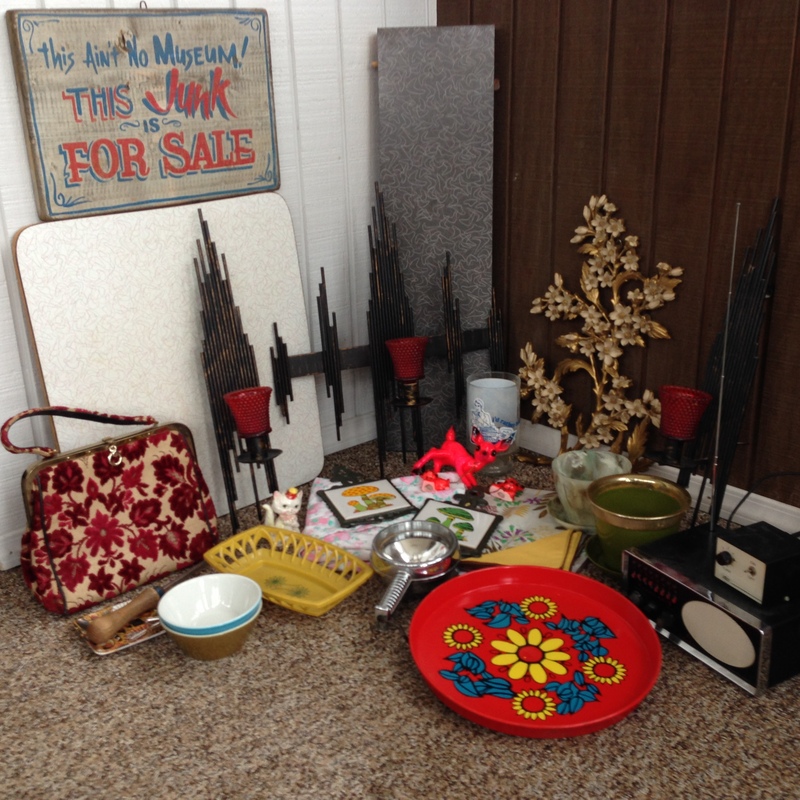 Buying, using, and reselling vintage items is giving pieces another chance that may otherwise end up in the trash. It is reusing what are often quality items and materials instead of purchasing new, often disposable and poorly made, furniture and home decor. So we think it is important to do our part to create a sustainable lifestyle that revolves around the repair, reuse, and restoration of previously used items. 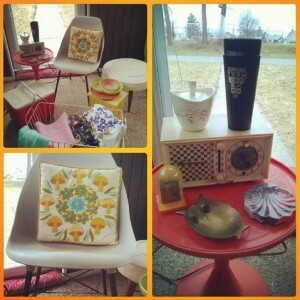 Why else do we love vintage living? We love the community! We love the people we have met during our years of collecting vintage and antiques. We love hearing the stories that accompany certain pieces, and we love being invited into people’s homes to hear their family stories and share their memories of earlier times. We may be dealing in “stuff”, but what matters to us are the human connections we make in the process. Of course, we also have to state the obvious – vintage living is FUN! We enjoy the thrill of the hunt, and the exhilarating rush that comes when we find a really good piece. We love seeing styles we’ve never seen before, or strange items we can’t identify. We’re not into vintage living to glamorize the past, because we’ll be the first to tell you that living in 2014 certainly has its advantages. If it weren’t for modernity, I couldn’t share these thoughts with you! But we love dealing with pieces from all eras, and we’re glad to play a small part in preserving and sharing our American material culture. Hello friends! We’re very excited to have this space set up as a place to share our love of vintage with you. We are Ten and Arlo from Pittsburgh PA. We’re lovers of the past, of material history, of quality antiques and inexpensive plastics. When we’re not doing vintage, we’re librarians with a host of other web projects. We hope you’ll follow us!